Here are the instructions for the construction of a basic 2.0m x 2.4m (6′ x 8′) grape vine trellis as shown below. I have highlighted the various parts on the picture below to assist in explaining the construction. Determine location for trellis. Orientation should run lengthwise north to south if you want to maximise sun coverage and not shade out any adjacent garden areas. 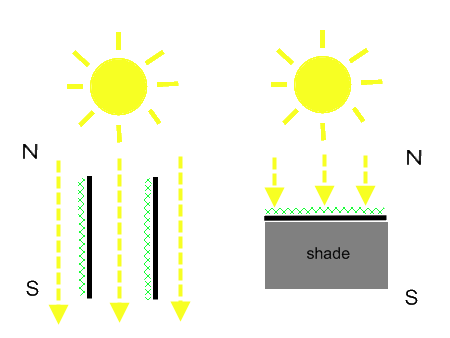 If you choose to use it for shade, position it to run lengthwise across the direction you wish to block the sun from. For example, to block the north midday sun in the Southern Hemisphere, place in a northernmost position running west to east. Drill the star pickets to allow them to be bolted together. Lay them on the ground, drilled edges of the uprights facing inwards (important, as this is where you will string your wire) arranged in an upside-down "U" shape, and hold the flat edges together as close as you can, and then work out where you need to drill them to bolt them together. 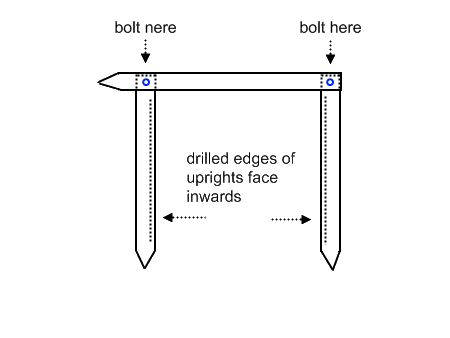 You will drill one hole at the top of each upright, and on the start picket that sits horizontally, you will need to drill one hole near the top, and one a short distance from the bottom (pointed end). Do not assemble at this point. Drive star pickets into ground, the correct distance apart. I drove mine 75cm (2.5′ ) into the ground, creating a 5.5′ high trellis. Depending in the firmness of the soil, this will hold. If it is loose, you may have to pack it down around the vertical supports, if that is insufficient, you may have to dig holes first and fill with a firmer material, or concrete. As a further note, if this trellis is at the edge of a raised garden bed, you can fasten the vertical supports to the side of the raised bed for further support. Attach 2mm wire through the holes of the inner edges of the vertical supports at the desired height. (You can use spacing of 30cm/1′ from the top, and every 30cm/1′ below that, this will give you three wires, with the lowest wire sitting approximately 60cm/2′ above the ground). In the picture of the one I’ve built, the wires are spaced 45cm (1.5ft) apart from the bottom, leaving a shorter distance to the top. Adjust to personal preference. Attach each wire to a turnbuckle, starting with the bottom one, working upwards, to tension up the wires nice and taught. Note, if the ground is not firm enough, and you tension up the turnbuckles too much, especially the lower ones, you will pull the posts inwards, and loosen the other tensioned wires above. You now have a completed trellis. All you need to do now is plant the grapevine in the centre and train it across the trellis as it grows. 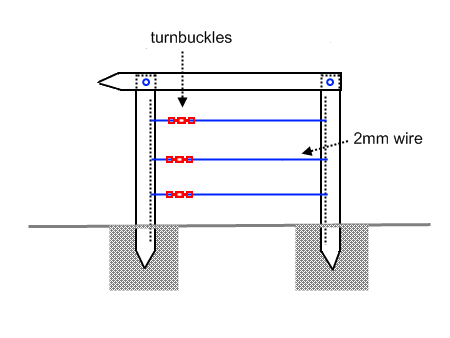 If you’re unfamiliar with turnbuckles, they a device for adjusting the tension on wire strung between two points. 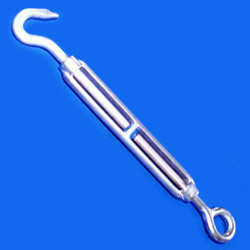 Turnbuckles have either two threaded eyelets on each end or a hook on one end and an eyelet on the other. They are screwed into each end of the long metal body. One eyelet has a left-hand thread and the other has a right-hand thread. 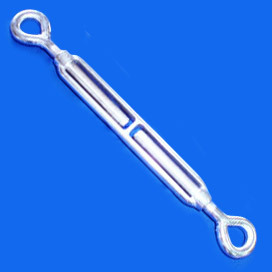 By rotating the metal body while the ends are fastened, the tension can be adjusted by causing both ends to be screwed in or out simultaneously. When using the type with the two eyelets, you fasten one end of the wire to the post, then the other end to the eyelet. 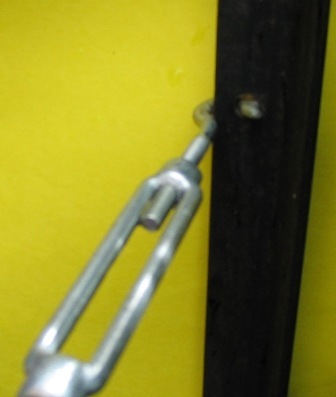 When using the type with the a hook and an eyelet, you can put the hook straight into the hole in the post if it will fit. Thread wire through eyelet, then rotate the loop so that a twist forms. Complete 3 to 4 twists. Bend back the end so it makes a right angle bend to the main wire . Wrap the end of the wire into a series of 3 to 4 tight rolls around the main strand or standing part to form the barrel–rolls. When tying wire directly to the post, you can simply use 3 to 4 barrel-rolls, I’ve found that this is sufficient. I really like this grape vine trellis. But i can’t seem to fine the star pickets in the U.S. I am also not sure i want to purchase them because they have pvc on them and i think another chemical. Do you have any suggestions? In Australia we use star pickets to string up temporary wire fences, barriers, tree supports and so on. The ones I use are just painted black, they’re not PVC coated, I wouldn’t use them if they were, as you mentioned, we don’t need another source of chemicals leaching into the soil. I did a bit of research, and it looks like you can also get star pickets that are bitumen dipped, or galvanised (both of which I have seen), and lo and behold, PVC coated ones too, though I can honestly say I’ve never seen the latter on sale over here ever. The wire I use for the plant supports is PVC coated, simply because I wanted it to be green in colour, but plain galvanised wire will work just as well. In the US you guys have such a wider choice of materials to work with when building anything! You could make the trellis out of any structurally sound material, such as galvanised pipe, metal fence posts, anything that you can bolt together. Galvanised water pipe would be my choice, it doesn’t rust, is very strong, looks nicesr than star pickets. You can get various pipe fittings to fasten the various pipes together. I’ve seen whole grapevine arbors and pergolas built out of the stuff. This might actually be my next project! PVC coated wire is also better for the plants – the galvanised can potentially be abrasive, as it isn’t smooth and becomes slightly more rough with exposure to elements. Great article and and tips. Looking forward to building this. I picked up some galvanized wire from the hardware store. It came with a warning of being carcinogenic, and recommended washing hands after touching. I am concerned about growing my grapes on it–do you have any information about this? Thanks for bringing this up, it’s amazing how many toxic chemicals are thrust upon an unsuspecting public in the name of money! This reminds me of the issue with plastic food and drink containers that leached the toxic endocrine disruptor and carcinogen, BPA (bisphenol-A) which have thankfully now been discontinued. Galvanized (zinc coated) steel is often coated with an additional passivation agent, a chemical which prevents the ‘white rust’ that you sometimes see on heavily weathered galvanised steel items. A safer substitute used to passivate zinc coatings is Trivalent Chromium (Chromium-3), which is not absorbed by the body’s cells. I’m not sure what country you’re in, as I’ve never seen warning labels on galvanised steel products in Australia, but if there’s a warning on the galvanised wire to wash your hands after handling it, chances are it has been passivated with Hexavalent Chromium, which is really bad! Seriously, get any other kind of steel wire other than one coated in a carcinogen! Wherever possible, avoid introducing such toxic chemicals into your food growing space. A good rich organic soil can bind up a lot of toxic metals through biosequestration – microorganisms and organic matter can absorb or bind these harmful substances to some extent, but there’s no point in poisoning the soil if you can avoid it. In my experience the plastic used to coat wire cables is often Poly Vinyl Chloride (PVC) PVC is problematic for a number of reasons. See Greenpeace and Center for Environmental Health and Justice. If you can’t find wire with a safe plastic coating, you can use galvanised wire, which will probably have a much longer life anyway. An excellent and very detailed instruction. Well done, most people do not bother to be so precise and that leaves the novice like me full of un-answered questions. 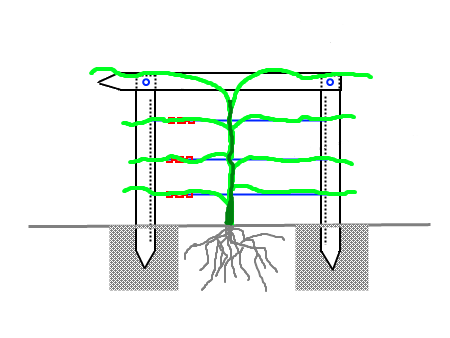 Hi, I want to grow espaliered fruit trees in frot of a colourbond fence. I don’t feel star pickets even with a brace across the top will be strong enough, am I correct. If I were to use galvanised pipe how do I drill the holes for the support wires? How close together can I plant the trees? I live at Lake Macquarie, NSW. Also can you recommend a good book for a beginner to learn from. Hi Suzanne, an espaliered tree does not really need that much support, it more or less holds up its own branches, the wires are there to guide the growth of the branches so the tree can be trained to shape. It’s slightly different to a grape vine or kiwi fruit where the trellis has to support a very heavy woody climbing vine. Galvanised pipe does make for a more tidy looking trellis, and you can definitely use one for a very sturdy espalier frame. The way you would attach the wires is to drill holes straight through the pipe in the same plane as the horizontal support bar, and either pass the wire through the holes, or for a more professional finish, use eye-bolts, with the eye facing into the frame, and the tightening bolt to the outside. “Espalier: Beautiful, Productive Garden Walls and Fences” by Allen Gilbert is a good beginners book on espalier. Incidentally, I had one of my traditional timber fences replaced with a colorbond fence recently and I realised you can’t attach anything to these fences, so I put in posts and strung wires to run some bramblberries and climbers over. Thanks for the tutorial! The grapevine in the first photo looks very sculptural, especially set off-center. I’m curious why it doesn’t have any leaves, when the rest of the garden looks quite lush…? Thanks for the nice comments, the grape vine has no leaves because the photographs were taken in very late winter/beginning of spring – I can tell because all the currants in the picture and the pomegranate have no leaves either, and the blackthorn (sloe) is beginning to flower. That’s how a food forest of perennials looks like through winter – quite lush, and it’s way more lush in the spring Summer growing season. Also, the garden in these pictures only only one year old at that stage! Hi, I love the design you have given to us and would love to follow it. My problem is that I live in an area that is surrounded by woods which brings in the creatures of the night. I believe I will use your design but put a wire protection around the new grape vine, then use the wire going up and down instead of crossways. This may help my animals of the night leave me some grapes. 🙂 Thanks for the much detailed design. Hi, I just installed a grape trellis after reading your blog. I did something totally different in the end, but I wouldn’t have done anything if I hadn’t seen this great website. Thanks for the great blog! 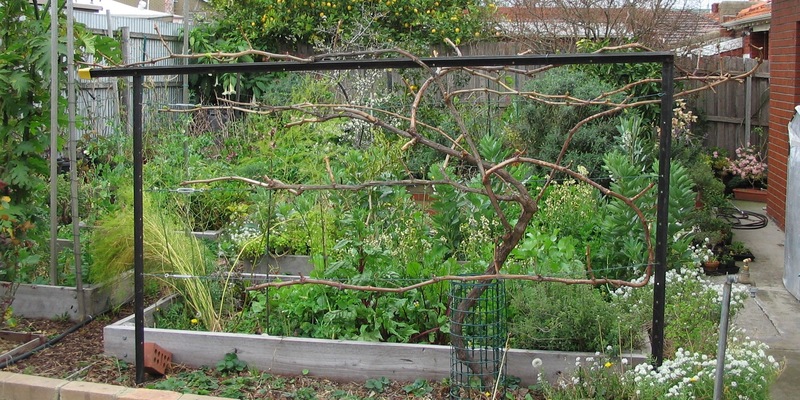 Glad you were inspired to build a grape trellis, you’re welcome! This looks like a good match for the kiwi plants that just came in. Thanks! How deep do these pickets have to go in the ground, is it the same as wooden posts, which we put in about 1/third of their length? Ours would be close to a fence and I’d like to grow a climber as a privacy screen. 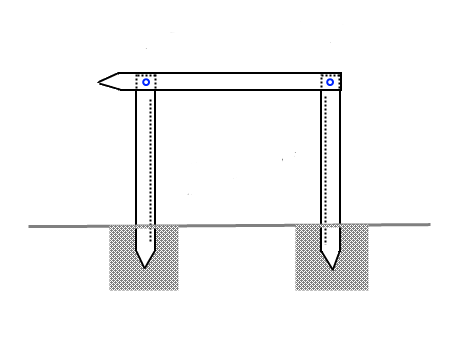 Yes, same depth as wooden posts, typically about 2′ (60cm) is the usual depth people sink the poles into the ground when building grape trellises. Hi there. I’m going to plant 3x table grape vines in my Sydney Aust home. You suggest the trellis run north south. would that not mean they are subject to very hot westerly sun; leading to leaf burn. I would have thought east west would be preferable as it would mean sun most of the day and avoid westlerly sun????? Grapes grow in hot, dry Mediterranean climates, they are used to cover arbours and pergolas that receive a lot of sun, in fact they are ideal for protecting other plants from the hot west sun! Hi there you suggest to run trellis north south where the grape fruits would subject to heat due to sun ray in which it would be damaged. what do you think if the rows run est west. In most hot climates grapes can handle the heat if they have sufficient water, which is why we use them to face the afternoon sun. I only use an east-west orientation when I’m growing against a north facing wall to make use of the heat that the wall retains as the weather cools down to extend the growing season..
You will need to feed your grapevines with fertilizer at the beginning of the spring autumn seasons. If grapevines get fungal diseases in your climate, you will need to spray them with a copper-based fungicide or lime-sulphur fungicide. Are there certain species of herbs, flowers, vegetables etc. that you would OR WOULD NOT plant right next to grapes? In the first year the grape vine is busy establishing its roots and gaining some height, your aim is to establish the trunk and laterals. After that it will grow vigorously. Fertilise as you would the rest of the fruit trees in your garden in spring and autumn. I was wondering if you knew of any potential toxic effects from using the bitumen coated star pickets in a growing bed. See I’m thinking from setting up a similar trellis system for my veggie patch to grow rotating crops of tomatoes, cucumber, climbing beans and peas. A permanent setup with a 2m trellis would be ideal. I was debating whether to use bitumen or galvanized pickets. I was erring towards the galvanized ones fearing some sort of toxicity from bitumen with polyaromatic hydrocarbons. However its hard to verify this concern as there is limited information. Plus bitumen pickets are much easier to source. I would value your thoughts. The vine has a lovely, organic shape. It basically looks like the kniffin system, but a bit untraditional with the canes arcing one way and then back around…. I assume because of your space limitation? What method do you use to prune it? Spur, cane, or something else? In this picture is it pruned and ready for spring growth? And does it produce lots of fruit with this method? It’s beautiful and would love to do mine the same. Yes, well spotted, there was a real space limitation, the trellis was large enough to produce about 9kg of grapes, but I wanted to extend it so I let the grapevine grow as much as possible, to also extend it over an arch, and then alongside of the house under the eaves to shelter it from rain, which eliminates most fungal problems. It now runs from the trellis over the arch and along the west wall of the house for a length of about 10m, as a unilateral high cordon – single curtain system, which is cane pruned because I’m using a sultana grape. On the trellis I’ll graft a spur pruned variety of grape as they are tidier easier to prune up on a small trellis in my opinion. Your site is incredibly helpful. Thanks for sharing with us. I’ve heard about many of these techniques, but seeing it has helped me tremendously.